Make no mistake, there should be no confusion. Keeping Tom Jurich is the right thing to do. 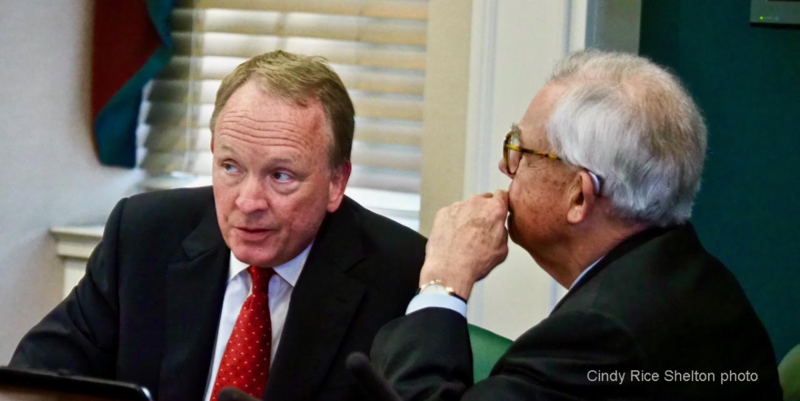 Surely common sense will prevail, and the Board of Trustees will retain him as Vice President of Athletics at the University of Louisville. There are no guarantees, however, that what’s best for the school will prevail these days. The notion of someone seriously entertaining the notion of firing Jurich is outlandish, insulting to the school’s alumni and supporters. Over two decades he has garnered unprecedented support, making UofL the most dynamic institution in the community. But these are not normal times, what’s up is down, what’s backward is forward, what’s out is in, bad taste is in good taste, what was once repugnant is considered the norm, and good people are often construed as bad actors. Crazy times. 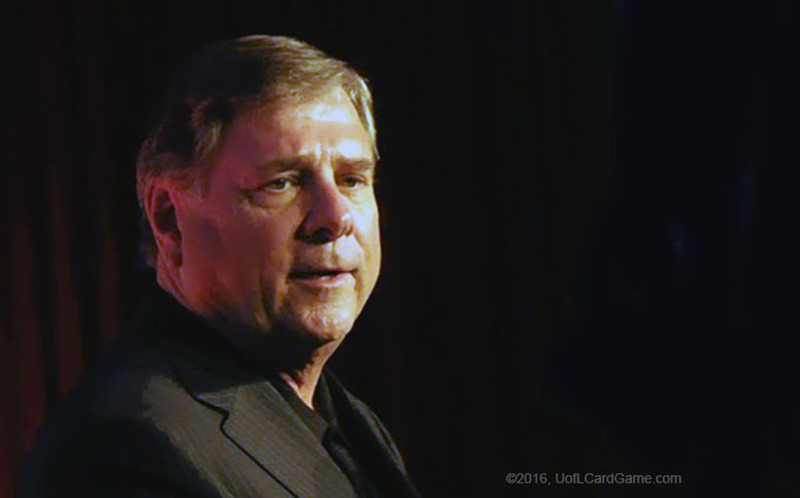 Tom Jurich wants his old job back even though it means answering to David Grissom and Greg Postel (Charlie Springer photo). Why Tom Jurich would want to go back to work for David Grissom and Greg Postel, the people reportedly wanting his job, is almost beyond comprehension. These are individuals who apparently consider the success of the athletic department a negative, unable to comprehend the positive role of sports in UofL’s rapid growth. To people who have been a part of this success, enjoyed all the new facilities, all the outstanding athlete and all the wins during Jurich’s tenure, the intentions of Grissom and Postel are counterproductive. So intent on seizing total control of the University that they are willing to sacrifice someone who can ensure the school’s development continues. What I have never understood is why Grissom and Postel could not appreciate the success of the athletic department. Why they couldn’t look at that success and want to emulate it for the rest of the University. Why they felt compelled to challenge the individual who made it happen. Why they wouldn’t want to get this individual in their camp, work with him and get him involved in resolving many of the school’s other challenges. 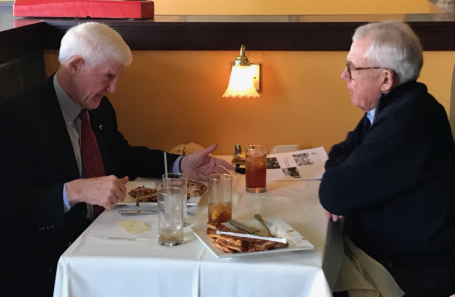 Grissom and Postel appear to share a similar management philosophy, wanting to clean house of people in power from the previous administration. Ignoring what they have done and what they can do, believing they know what’s best. Based on some obscure business principles from some antiquated management courses. What they haven’t been able to do, however, is convince UofL supporters and fans that they have the school’s best interests in mind. 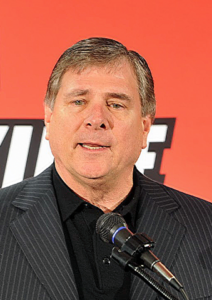 The only agenda Tom Jurich has is to continue the incomparable growth and success of the school’s athletic program. He wants to be there when UofL cuts the ribbon on the 10,000-seat expansion of Papa John’s Cardinal Stadium and when another 3,000-seat expansion of Jim Patterson Stadium is completed. He wants to be there when UofL teams are competing for national championships, when UofL athletes are competing for gold medals. He needs to be there to ensure the right person is hired for the next UofL coaching vacancy. He wants to be there to help guide the basketball program back from the current crisis. That is why he wants to return, even if means answering to Grissom and Postel. Something anyone other than a UofL fan would have a hard time believing. Based on his track record, Tom Jurich deserves the opportunity to return to do the job he loves. There is no better option for members of the Board of Trustees, nor for the University of Louisville. Vince Tyra’s top priority personally and professionally is to see UofL athletics continue to thrive. 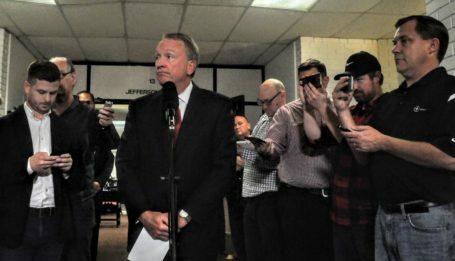 We may never know how many people were interviewed by the school to fill the acting athletic director’s role during Tom Jurich’s suspension. Nor should we care because Vince Tyra appears to have been an amazing hire. Uniquely qualified in so many ways, for either the short-term or the long haul, ready to totally immerse himself in his new post as Acting Athletic Director at the University of Louisville. He’s a life-long UofL fan who closely follows the school’s academic and athletic programs, wanting to take them to the highest levels. He hails from a UofL family and the son of the basketball program’s first consensus All-American basketball player. 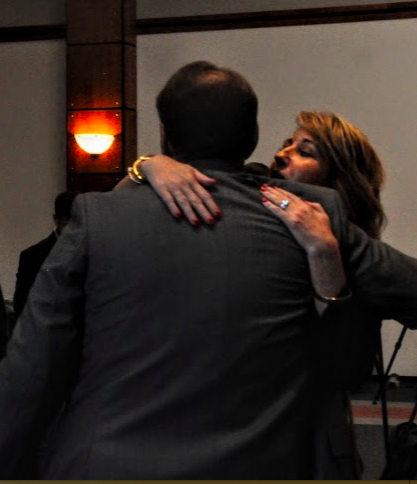 Tyra is congratulated by his wife Lori following the press conference. And he admires and respects Tom Jurich for what he has accomplished at UofL, considering Jurich among the best in the business. 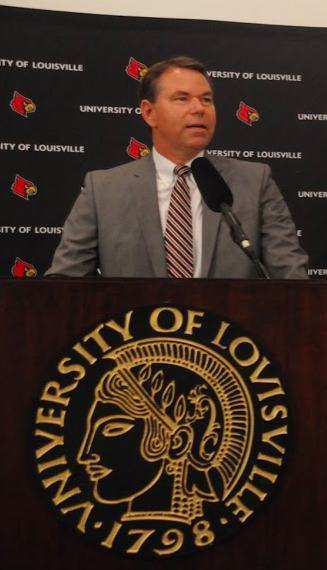 “I’m passionate about UofL athletics, I grew up a Cardinals’ fan, raised my kids as Cardinals’ fans,” he said during a Tuesday press conference at Bigelow Hall on Belknap Campus. “Tom is a good friend. His legacy is all around us. While this has been a difficult period for us, it’s a time for our fan base to dig in even deeper. It’s a time for us to be even more supportive. Tyra’s 80-year old mother still attends every UofL basketball game and he said she cheers like her late husband Charlie Tyra is still playing for the Cardinals. His father averaged more 20 points and 20 rebounds per game during his junior and senior seasons, leading Louisville to a National Invitation Tournament championship in his junior year. 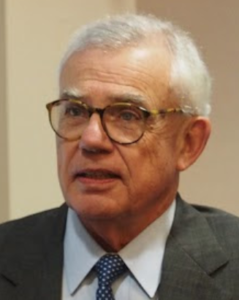 Vince has blazed his own trail, has been enormously successful in business, serving as Chief Executive Officer for five companies, most recently as operating partner in Southfield Capital and as an advisor to ISCO Industries where he served as president. He was also president of retail and active wear at Fruit of the Loom. 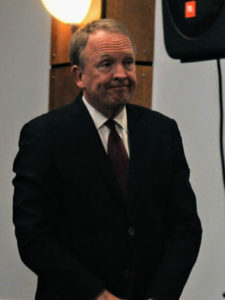 Interim President Greg Postel listens intently during Tyra’s remarks. 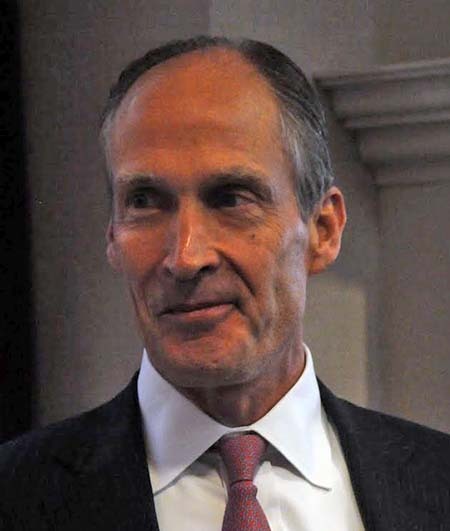 When a new board was appointed for the University of Louisville Foundation last year, Tyra was named chairman of the ULF’s finance committee, establishing new guidelines to control spending and to restore credibility with major university donors. 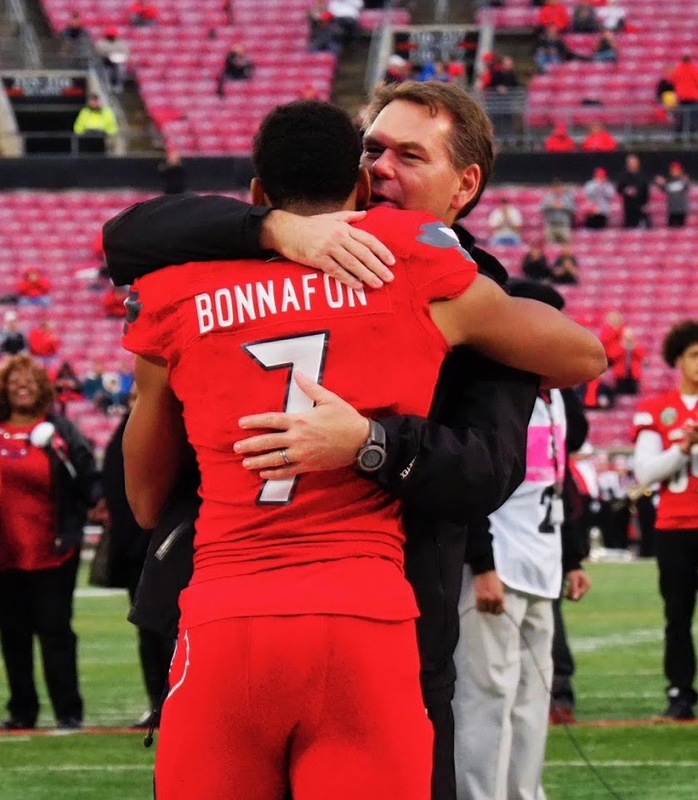 It was obvious during his introductory press conference that Vince Tyra is an individual who has considered himself a part of the University of Louisville family. He was convincing when he said very much appreciates what Tom Jurich has done for the school. 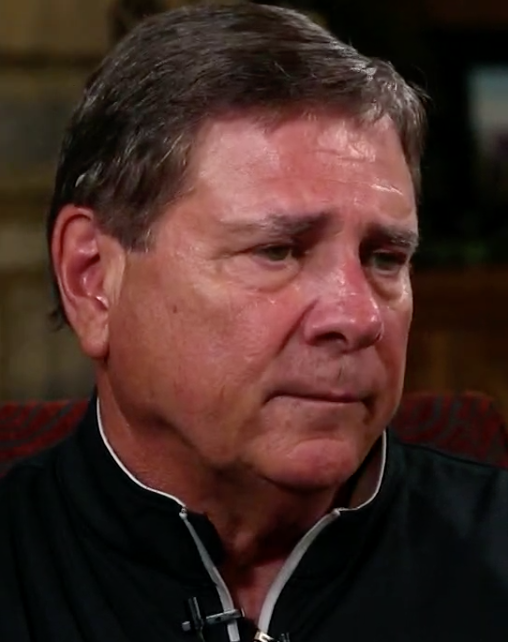 One got the feeling that while he would devote a great deal of energy to the job and probably be enormously successful, Vince Tyra would have no problem stepping aside if Tom Jurich were allowed to return and continue his life’s work. 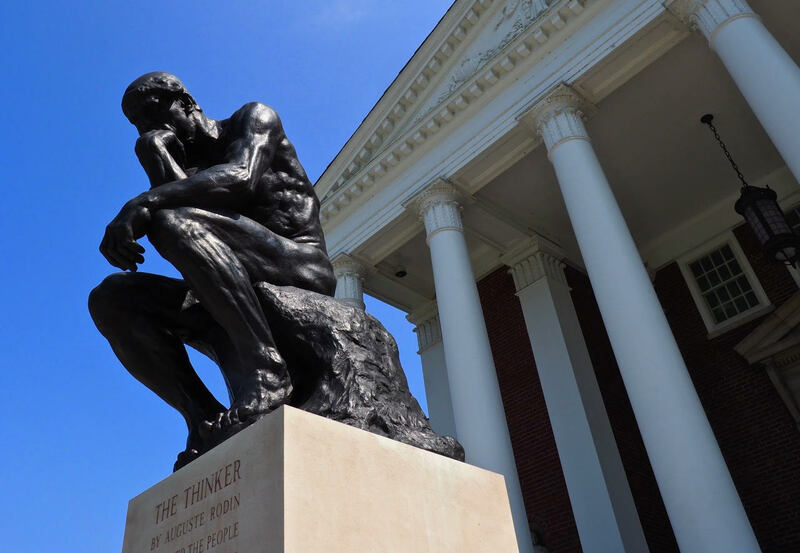 They share a common interest, first and foremost, in seeing UofL thrive and prosper again.